Railway Post Offices were one a very efficient way to move mail across the country. This was via a contract with the Post Office and the railroad for service. Most every rail line had RPO service. The designated train had a special car that had mail from the regional center in bags for towns along the line. As the train passed through each town, a bag was thrown off to the station and another was taken aboard. That bag was then sorted and placed in the bags for further delivery down the line or for return to a regional center. Since the RPO operated in each direction, towns got twice daily mail service. 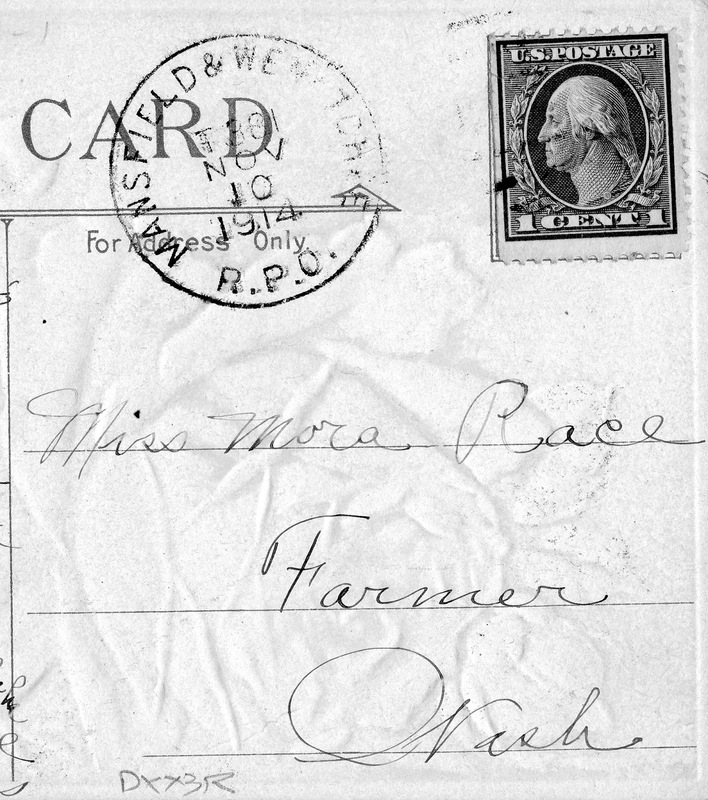 This postcard was delivered by train #381, the Mansfield & Wenatchee RPO on November 10, 1914. This train was discontinued in January 1925. When I hired on at the US Postal Service in 1973, there were still some former RPO clerks working in the main Seattle Terminal Annex. The RPO trains were discontinued a few years prior to that. I remember one particular clerk, Ben, who when sorting mail at a "flats case" would brace his legs against the case. This was a habit that he obviously picked up working in the swaying RPO cars. They had many great stories to tell.